Adam, the first man, towers under the looming ice-crystal veil enveloping prehistoric Earth. 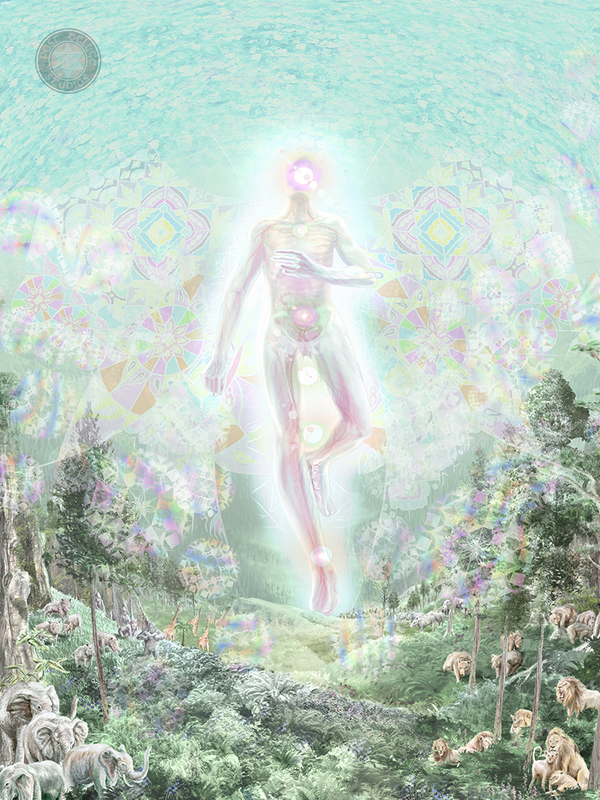 Appearing as an angelic and titanic apparition, featureless and without any sense of self, his chakras glowing, radiating, and connecting to mother-nature in a dazzling kaleidoscopic array. It is his great impersonal ego, emanating a rainbow of hues out into the copious mega-flora. On all sides, he is surrounded by all of Earth’s creatures, as if under their watchful protection. This entry was posted in The Disintegration of Eden and tagged Adam, animal, chakras, digital, DNA, earth, eden, genesis, giants, illustration, kingdom, nature, prehistoric, spiritual. Bookmark the permalink.